How often does Live Search changes its background? 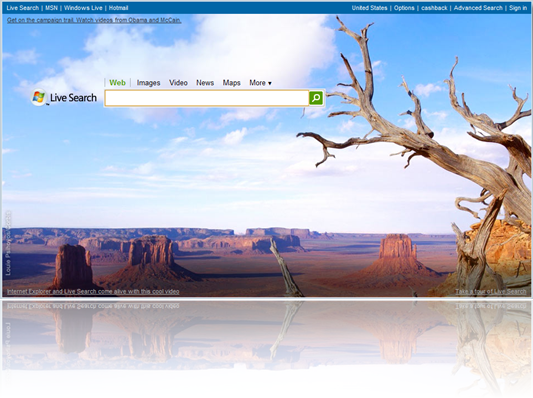 Back in July 2008, Microsoft added background images to Live Search homepage. While it didn’t added much to the overall function of the search engine itself, what it added was a nice touch to the homepage which differentiated it with other competing search engines like Google and Yahoo. For the last few days, I was wondering how often does Live Search changes its background image? After thorough observation, I came to the conclusion that Live Search homepage automatically changes background images daily at exactly 1.00 AM Seattle PDT (Pacific Daylight saving time). Click here to check out the exact time of your city at which Live Search changes its background image. Do let us know whether or not the change occurs for you at the said time. I think the pics are great… but here in Australia all we get is the ugly Live search without the picture… how hard is it to give pics internationally as well as America? really? I have been told that the images do appear in European and Asian countries. Dont know why aussies r left out. why only in the US? I never actually go to the Live.com page since I have live search as my default browser provider. No background pictures in Finland. I am wondering since they changed this – how can I get all pictures that are published as a live search background? Is there any database where I can download those pics? These pictures are simply great!!! Something new from the traditional search engines!! !